To put the messages with newest first, is that a preference I have to make? Yes, that you can do in your Profile Settings, Look & Layout prefs. Down towards the bottom. I've got the urge to post a tin of Spam, but really can't be bothered. well, I try to be moderate. <------------------------ OK, what are these bloomin block things. I can see some connections between Admins - blue, Supreme Webmeister - orange and the remaining hoi polloi in yellow. However the number of blocks seem to reflect the number of posts, except that Pedders is leading the pack at 6k odd and he's got the same number as the others, and in terms of block quantity, you seem to get more yellows per post than blue ones. Well, if mods and admins had blocks commensurate with their post counts, they'd fill the whole page! I think they ought to be biscuits, not blocks. Someone ask the admins if they can arrange it. Someone ask the admins if they can arrange it. 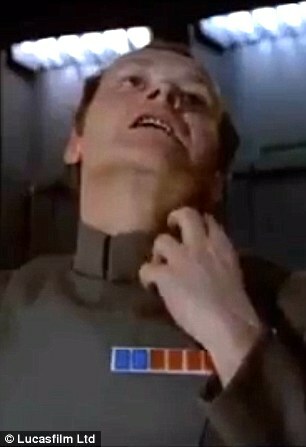 Actually, RIP Richard LeParmentier, the actor who played Darth Vader's "Force-choke" victim (above), who died on Tuesday this week. Oh no, really? That's a shame. I was just going to demand the whereabouts of Mr. Green. There are lots of new emoticons hanging around up there ^ but not my grinning green fellow. Bah!